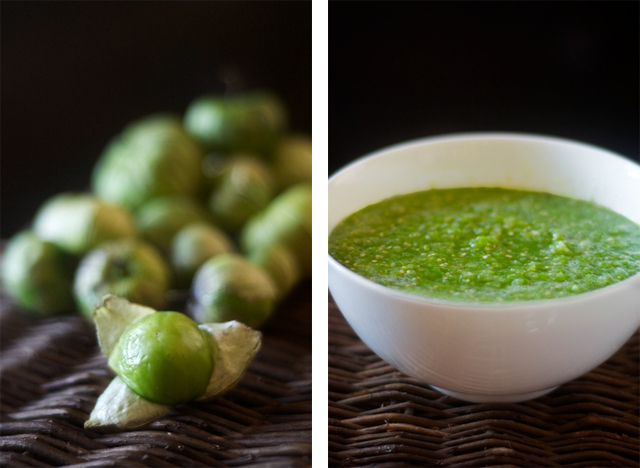 Salsa verde, bright and hot and green, makes its way to our kitchen every August when tomatillos come into their season. No, they don’t grow in our little corner of the community garden – the altitude is too high and the climate too cold, but they arrive in paper bags with our CSA and in baskets at the farmers market my husband and I manage. 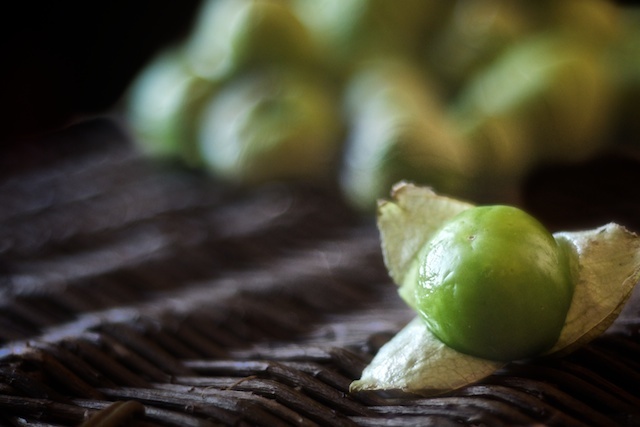 While lovely roasted, tomatillos are better served fresh and raw where their vibrant acidity contributes a beautiful punch of flavor to a truly good salsa verde recipe. A good salsa verde recipe should be light and green, both in flavor and appearance, and it’s salsa verde’s very lightness that lends itself so well to summer foods: grilled meats and fish as well as classic Mexican and South American dishes like anticuchos de corazon (that, dearest real food lovers, is coming). So when I’m looking for something bright, fresh and delightfully raw to lighten up the otherwise rich, buttery and slow-cooked dishes I tend to prepare. Fresh whey drawn off after making labneh (yogurt cheese) acts as an excellent inoculant for all fermented foods, but can be particularly helpful for sauces such as salse verde which have a greater chance of going awry than other ferments. While whey works fine in this salsa verde recipe and in other fermented foods, I prefer to use a vegetable starter culture, which you can purchase online, as such starter cultures convey the added benefit of culturing specific beneficial bacteria which offer therapeutic effects on digestive health. While ostensibly more expensive than fresh whey, the therapeutic effects of culturing particular beneficial bacteria, much like the therapeutic effects of a daily dose of cod liver oil (see sources), makes it a worthwhile expense. Wow, that’s a spicy salsa! I just did a batch that is fermenting now, and it was 2 lbs tomatillos to 4 jalapeños. Why is salsa verde more likely to “go awry?”. I’ve had a few mold on me, but I also wasn’t measuring my salt correctly. A few times. For the fermentation time, does one put a lid on the jar or just cover it with a cloth (like with kombucha)? yes, but you should burp it. I always keep all jars of fermenting foods in a dish to catch any overflow that may occur. I’ve been looking for a recipe like this, and can’t wait to try it! Can the culture be substituted with whey? And if so how much? I was excited to find this recipe (& site) because I’d been looking for a recipe like this. I added the 1/2 pack of culture starter but I made some changes to the recipe to suit my tastes. I decreased the jalapenos (8 way to spicy for me) & garlic to two each & added 1/ 2 cup of chopped cilantro. I’ve never fermented before, and this looks like a great recipe to give it try with! Question, I just got a beautiful German made ceramic fermentation pot. It comes with a few traditional kraut recipes, yet they all take well over a month for fermentation to be complete. I just searched for a salsa recipe and came upon this excellent one here. My question is: Am I seeing correctly, does it really only take 3-5 days in a Harsch ferment pot with the starter to have salsa that is ready to consume? Or, do you have to jar it and let it ferment longer in the jars? Thanks! I’ve just started the fermentation journey beginning with Sandor Katz and The Art of Fermentation. I used this recipe, but halved the jalepenos. I also didn’t bother with any starter culture as I figured the ingredients should contribute enough bacteria to let things work out on their own. I did have to ferment longer than the 3-5 days, possibly due to the lack of starter and the cool area of the house that has become our fermentation spot. I probably went in the range of 7-9 days. You can see them in the foreground here, with my sauerkraut and kimchee in the back. No issues with mold (none with any of my ferments yet) and it was one of the best things I have made. Absolutely fantastic flavors! I love salsa verde. I have made some from a different recipe. I’m intimidated by this one because I don’t think I understand the whey thing. I visualize yogurt “juice” but I never seem to get enough from the yogurt that I buy to do any fermenting. Is the whey powder that you can get at the Coop Food store ok to add for the recipe to work? I get the concept, but the practicalities are stopping me from jumping in to the fermentation game. Whey powder will not work it is a powdered protein produced from whey. Are you straining the yogurt in the fridge overnight? That really should produce enough whey to use as a starter, if not check the ingredients, there maybe added ingredients to prevent the yogurt from separating. You can get more whey by placing in cheese or nut milk bag or cheese cloth and hanging over a bowl for a day. You end up with more whey and Greek yogurt! How long does this last in cold storage? Is substituting with whey ok in this recipe and could I use up some frozen tomatillos for this recipe? Thinking maybe not on the later. Would the vegetable culture be the same as what is in sauerkraut? Can a powdered yougurt starter be used? I have some I bought to make non-dairy yogurt out of cashews (or other nuts). Just wondered if I could use that as a starter for this. If yoghurt is a thermophilic culture – how can the whey be used in a room temperature fermenting process? That’s a great question. Yogurt is thermophilic (most yogurts are, anyway), but that doesn’t mean that those cultures won’t proliferate at room temperature; rather, it just means that they proliferate best at a slightly elevated heat. Remember, yogurt cultures between 6 and 12 hours, typically, which is pretty fast. Heat accelerates fermentation. Ferments using whey as a starter usually ferment over a matter of days, as the cooler temperature promotes slower fermentation. You can can this salsa, but you’ll defeat the purpose of fermenting it if you do so as you’ll kill all the beneficial bacteria and many of the heat-sensitive vitamins created during the fermentation process if you can it.